Anyone who owns their own homestead has many options to consider. You may want to have a variety of animals to use as a source of food. This includes chickens, ducks, goats, pigs, and cows. A cow is a great option of you want to have meat and a source of milk. 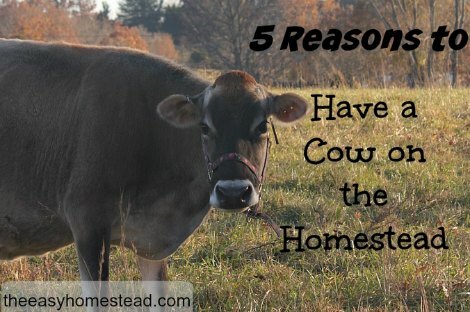 There are many reasons to have cows on your homestead. Getting a cow is similar to having a pet. You will need to provide it with a source of water, food, and a place to do the milking. If you do not have any type of outbuildings on your property, then you need to decide on the type of structures that are necessary. Any covered area can be used when milking a cow. The structure is needed to ensure you are protected from the weather. A milking station will also be needed for the cows. However, a barn may is needed for storing any feed and equipment necessary to care for cows on your homestead. One important thing you need to have on your homestead for any cows is a pasture. The pasture for a cow can be any area that is fenced and has suitable grass. You can gather manure to use for fertilizer in other areas of your property like a garden. Cows will not need much to thrive when on a homestead. All you need to do is provide the basics. If you have only one cow, then you may see additional benefits by adding a few more. A cow is an animal that can be used to help maintain your homestead. However, your homestead might not be ready to sustain a new animal. You need to research the process and be prepared to do any type of work that is necessary.